UPDATED: 4/24/16 Every once in awhile, there’s a recipe that just goes slightly viral and then, there’s the recipe that is by far the most popular recipe on a blog. For The Veg Life!, this Vegan Coleslaw is THAT recipe. 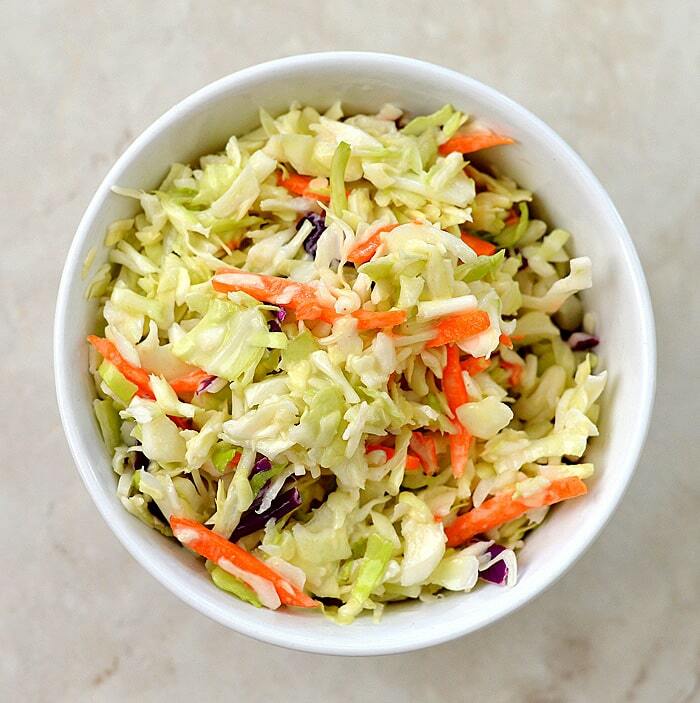 Little known fact about me…I love coleslaw! I really do. I’m not sure why, but it’s in my top 5 favorite foods I think. And now I have a delicious vegan version to enjoy. There is a certain seafood restaurant chain with a red lobster (hint hint) in it’s logo whose coleslaw happened to be my all-time favorite before I chose to do the vegetarian/vegan thing. I really wanted to see if I could somehow come close to that recipe using all vegan ingredients. We’re lucky that both vegan mayonnaise and sour cream are now more readily available to us. My local grocery store carries both! From there, it’s all about the seasoning. Now, at that famous above mentioned restaurant, they add celery seed. While I’m not necessarily opposed, I’m not necessarily a fan either. I prefer lots of freshly ground black pepper. Please feel free to season according to your own personal taste. Did you make this recipe for Vegan Coleslaw? Leave me a comment below and let me know what you thought! And if you enjoyed this recipe, PIN it for later! Combine the shredded cabbages and carrots together (or you can just buy pre-bagged coleslaw mix). In a separate bowl, whisk together the dressing ingredients. Add to the cabbage mixture. Taste for seasoning, adding more salt if necessary. Allow to sit for at least 30 minutes prior to serving. And finally…how about a little lemonade to go with all that? Did you get to try it? I think it is really good. Really great! Thank you. I am always so happy to find great dairy free versions of my favorite foods. I tried this without the sugar, and it was awesome! Great recipe! Thanks. You forgot to mention the onion! I really don’t remember how RL’s coleslaw tasted but your version is so delicious!! Just stumbled upon your site & looking forward to trying out your other recipes. Just tried this recipe and it is AWESOME! I’m very picky about my sale and this hit the nail on the head. Perfect balance of sweet and vinegar. And it was amazing as a topping on my pulled “pork” (jackfruit) sandwiches! *slaw not sale. Autocorrect FTW! On a sandwich, sounds great,maybe I’ll add it to my untuna collard green wrap for lunch. Why does the nutritional value include cholesterol? Weird… I guess you just used mayo as an ingredient during calculations at an external site? Recipe looks great, can’t wait to try it! Added some fresh-squeezed lemon juice for additional zing. Also, not sure why, but the cole slaw was kind of bitter, but left overnight and the bitterness was gone. Delicious! This is my go to coleslaw recipe! Thank you for sharing! I love coleslaw, and this looks like a really awesome recipe. I’m not much on making vegan food (apart from my cupcake recipe that I pull out if I need to do something vegan), but this sounds like a yummy recipe that I need to make–I doubt my husband would even know. Thank you for sharing! I made this for my husband’s company party and everybody thought it was delicious. No one could tell that it wasn’t made with real sour cream and mayonnaise. Vegan sour cream? I’m not sure where to find that without driving all the way to whole foods 2 towns over. Is there anything I could substitute for that? Hi Sara, no need to drive that far! 🙂 You can substitute vegan yogurt (or yogurt if you are not vegan), any non-dairy milk, cashew cream (if you make your own), homemade vegan buttermilk (2 tbsp non-dairy milk plus 1/4 tsp vinegar) or even just leave it out.